Newly elected President of the Association Vyas Deo Sharma and Minister for Industry, Trade, Tourism, Lands and Mineral Resources Faiyaz Koya at the Real Estate’s Annual General Meeting. Photo: Charles Chambers. Real estate companies were yesterday told to work within the ambit of the law and ensure that the industry was clean of unscrupulous dealers. 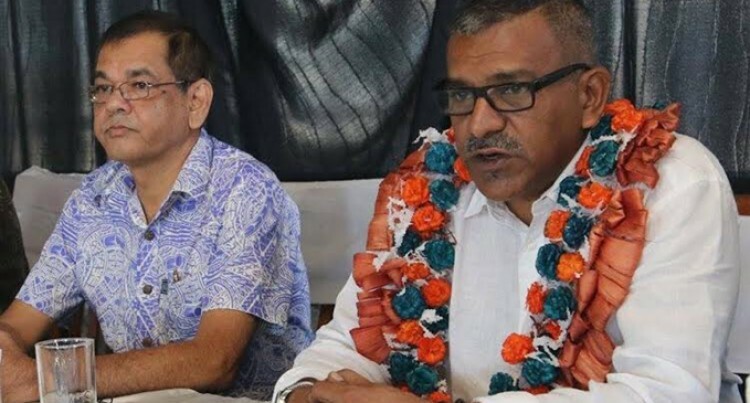 The Minister for Industry, Trade, Tourism, Lands and Mineral Resources, Faiyaz Koya, while addressing the Annual general Meeting of the Real Estate Agents said this was because Government was taking steps to make affordable housing available for all Fijians. Mr Koya said this was why Government introduced the Real Estate Agents Act in 2006 which then regulated the real estate industry in Fiji. While reiterating on the growth of the economy and the Budget, Mr Koya said this was the first time in Fijian history that the economy had grown positively for 8 consecutive years. He said there was a great demand for housing, especially in the major urban centres and this continues to increase. He reassured the real estate industry that their suggestions and recommendations would be taken on board by his Ministry through REALB. “As the Minister responsible for consumer protection, I would like to see all stakeholders in the real estate industry working together, familiar with the rules and procedures pertaining to property transactions and ensuring that consumers’ rights are protected. Stronger provisions on commission payable to real estate agents. New elected Office bearers: President Vyas Deo Sharma; Vice Presidents Aren Nunnink, Charan Jeet Shergill, Sakeo Lelekilagi; General Secretary Anand Gounder; Assistant General Secretary Shasi Prasad; Treasurer Romill Prakash; Committee members Sohan Lal, Mohammed Ahmed, Chandra Mani.